A painting of the Visitation, by TFP artist Dias Tavares. The following text is adapted from a lecture Prof. Plinio Corrêa de Oliveira gave on July 2, 1970. 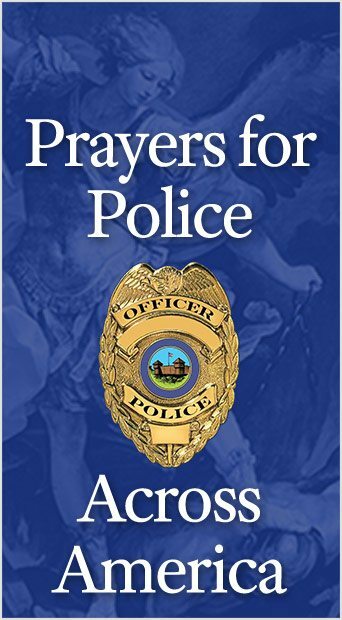 It has been translated and edited for publication without his revision. 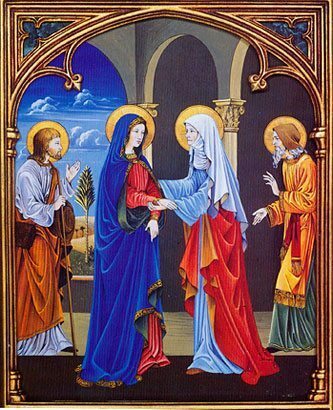 The story of the Visitation of Our Lady to Saint Elizabeth is well known: When Saint Gabriel appeared to Our Lady during the Annunciation, he informed her that her cousin, Saint Elizabeth, was with child. Our Lady traveled with Saint Joseph to Saint Elizabeth’s house, to care for her until her son, Saint John the Baptist, was born. Although Our Lady had already conceived the Child Jesus, she had not told anyone. Nevertheless, Saint Elizabeth had a presentment that the Child Jesus was in Our Lady’s womb. Thus, she greeted Our Lady, saying: “Blessed art thou among women and blessed is the fruit of thy womb.” (Luke 1:42) When Our Lady spoke to her, Saint John the Baptist heard Our Lady’s voice, was sanctified by it and leapt of joy, inside Saint Elizabeth’s womb. This story is rich in applications to the interior life. First of all, it highlights the virtue Saint Elizabeth, whereby she sensed the presence of Our Lord in Our Lady’s womb. Obviously, this was a special gift. However, every Catholic should have a high degree of this sense, albeit with less intensity and excellence. Through corresponding to the grace of Baptism, a Catholic begins to perceive, so to speak, where God is and where He is not. This applies less to God’s physical presence, as in the Eucharist, than His moral and supernatural presence. Thus, the true Catholic senses whether or not something is compatible with God. To do this, he need not have intelligence, culture or theological training, but rather a “Catholic sense” of things. Saint Elizabeth epitomized this “Catholic sense” when she perceived the presence of the Child Jesus in Our Lady’s womb. This seemingly creates a problem: Saint Joseph was unaware of Our Lord’s presence, even though he was greater than Saint Elizabeth. While the Church counsels the faithful not to compare saints, since such comparisons are below the dignity of saints and above human wisdom, the fact remains that Saint Joseph was the most chaste spouse of Our Lady. As such, he had a much greater union with her than Saint Elizabeth, who was only Our Lady’s relative. Since a saint’s greatness is proportional to his union with Our Lady, it would seem that Saint Joseph was much greater. However, if the knowledge of the presence of God is a virtue and Saint Joseph was a greater saint, one would think he also would have perceived the Incarnation. Furthermore, he was truly Our Lady’s husband. As such, he possessed a true right over the legitimate fruit of her womb, even though he was not Our Lord’s father. This problem is easily resolved. God distributes glory to men according to His unfathomable designs. He glorified Saint Elizabeth by allowing her to sense Our Lord’s presence. Thus, she will be forever venerated for having perceived the Incarnation so early and sung the praises of Our Lady as Mother of the Child Jesus. However, God also glorified Saint Joseph by hiding Our Lord’s presence from him. His ignorance was glorious because it produced a great perplexity in his soul when he was confronted with the reality of Our Lady’s pregnancy. It forced him to prove his love of God and demonstrate the height of his virtue. No man in history weathered so great a storm while practicing such virtue as he. Thus, for all times he will be the patron of those who suffer perplexities. Although it is something the faithful are not obliged by the Church to believe, many authors propose that Saint John the Baptist, being the last and greatest prophet of the Old Testament, synthesized all the glories of official prophetism. They suggest that he was entirely lucid in his mother’s womb. Thus, he appraised the sacredness of the Mother of God and the Incarnation, heard Our Lady’s voice, felt the presence of God and leapt for joy. At that moment, he was sanctified. This is the power of Our Lady. The mere echo of her voice instantly converted Saint John to a high degree of sanctity. We too should hope for this grace. We should ask her to speak to the innermost regions of our souls and instantly sanctify us. One word from her can bring us to a degree of virtue that years of struggle, without her help, would not obtain. We should ask Our Lady to grant us the same grace she gave to Saint John the Baptist, namely that she speak to our souls, make them leap for joy and instantly sanctify us. This entry was posted in Plinio Corrêa de Oliveira and tagged Catholic sense, Child Jesus, glory, grace, interior life, O Lady, Our Lady, perceive, Prof Plinio, reflections, regions, Saint Elizabeth, Saint John the Baptist, sanctity, soul, theological, this aplies, unfathomable designs, visitation, womb by Plinio Corrêa de Oliveira. Bookmark the permalink.